Geneva – IOM, the UN Migration Agency, reports that 170,249 migrants and refugees entered Europe by sea in 2017 through 20 December, with just over 70 percent arriving in Italy and the remainder divided between Greece, Cyprus and Spain. This compares with 359,160 arrivals across the region through the same period last year. On Thursday (21 December) IOM Athens’ Kelly Namia reported on three incidents off the island of Lesvos and Rhodes that required search and rescue operation. The Hellenic Coast Guard managed to rescue the 120 migrants and transferred them to the respective islands. Through 19 December, the total number of sea arrivals to Greek territory is 28,800 (see chart below). IOM Spain’s Ana Dodevska reported that total arrivals at sea in 2017 have reached 21,468 men, women and children who have been rescued in Western Mediterranean waters through 21 December. That figure is 13,076 greater than through the same date in 2016. IOM’s Missing Migrants Project (MMP) reported Thursday one new death on the Mediterranean as the remains of a migrant were found in a boat, four miles off the coast of San Roque, Cádiz (Spain) on 15 December. 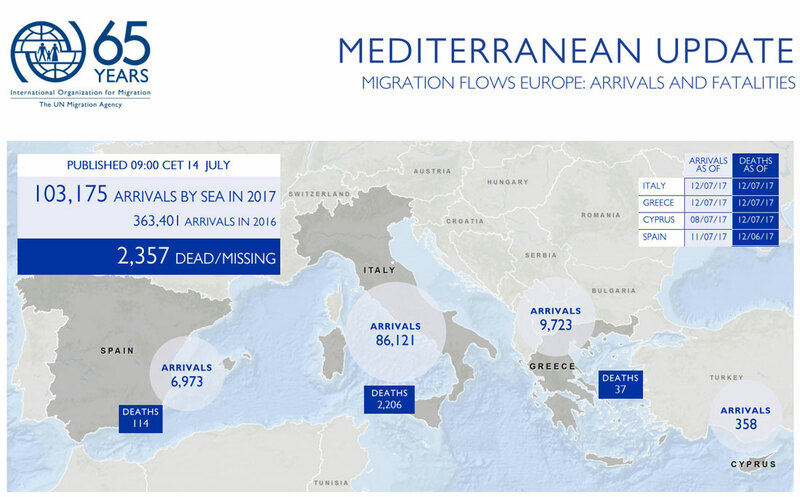 IOM has recorded the deaths of 223 migrants this year on the Western Mediterranean route to Spain in 2017—a number that surpasses the total number of deaths recorded in the Western Mediterranean for all of 2016, which totalled 128. Since the start of December, the Western Mediterranean has been the deadliest of all Mediterranean routes, with 15 deaths of sea borne migrants reported, compared to eight deaths this month on the Central Mediterranean and none this month in the Eastern Mediterranean. Twenty-three deaths this month on the Mediterranean is a significant decline from recent years. In 2015 over 200 drownings of migrants occurred on the Mediterranean in December; in 2016 almost 400 took place. Total deaths in the Mediterranean now stand at 3116 through 21 December, compared to 4,967 at this time last year. Worldwide, IOM’s Missing Migrant Project (MMP) has recorded the deaths of 5,362 people during migration in 2017. Besides the recent Mediterranean deaths, MMP recorded five Afghan migrants dying in a vehicle accident near Isfahan, Iran, on 16 December. On 19 December, an 18-year-old Pakistani boy died of hypothermia in the Evros River, on the border between Greece and Turkey. Also on 19 December, six migrants lost their lives in a vehicle accident in Tamaulipas, Mexico: five Honduran men and one Mexican woman travelling to the US border died on the Zaragoza-González highway.